When someone says the word garden, most of us picture a large, lush, plot of land full of fruit and vegetables, or a wide variety of beautiful fragrant flowers, shrubs, fountains, ponds, and other natural landscaping features. We imagine such places in backyards with lots of wide open space. So perhaps the opposite of that idealized image then, would be creating a garden in a small, barely big enough to need a lawn mower plot of land flanked on all sides by other buildings. But this is the reality for homeowners in many major cities with densely populated neighborhoods like those youll find in New York, Chicago, San Francisco, and so on. There the traditional vision of a home isnt a large backyard with ample room to garden, play catch with the kids, and landscaping. Instead property is at a high premium and the buildings and lots are long and narrow, with multi-story brownstones representing most of the homes or apartment buildings. Instead of a huge backyard, most homes have a postage stamp sized backyard by comparison. Barely enough to bother mowing. And sadly for some homes the owner forgoes a backyard entirely and opts to fill their precious little yard space with a cement patio or crushed gravel, etc. Those who live in those types of environments genuinely miss out on having green space in their lives. Sure you can visit Central Park in New York, or go for a run or a bike ride along Lake Shore Drive in Chicago, but it isnt the same as drinking coffee on the patio in the morning, or grilling out at night and enjoying the scent of fresh cut grass or flowers, tending to your flowers or tomato plants, or walking barefoot on the lawn. We all need a little bit of green space in our lives. So what do you do if you have one of those after thought backyards at your urban home? How can you make it an inviting sanctuary like place with just a small amount of physical space? Consider the bright side of having a small yard like the spaces we described thus far. Adding some key accents can go a long way towards creating an intimate, easy to maintain space that suits your needs and has a very comfortable, relaxing aura to it. Take a look at this collection of pictures of urban courtyards and patios we have collected on one of our Pintrest boards to see some examples of homes which are making the most of their small backyards or courtyards. While these are not projects we have done, using our products you can achieve similar results. Think about what youd like to do in your backyard. Do you want to grill out? Do you want to garden? Have you considered some water features? What about seating for you and your guests? We can help! Carved Stone Creations offers a wide variety of natural stone landscaping accessories that can help transform your backyard, no matter how small. Lets take a look at some of the natural stone accessories we can offer you. Lets start with the patio. Skip the boring concrete slab or terra cotta brick patio and lay down some beautiful natural stone pavers to make up your patio space. A small foot print to begin with can help make more exotic stone within your budget too. Take a look at some of the stone pavers we have available below. Create a distinctive and inviting old-world look on any back yard patio with these 1.5″ thick Serengeti Gold Quartzite Pavers. Because of the thickness, they do not require a concrete slab. 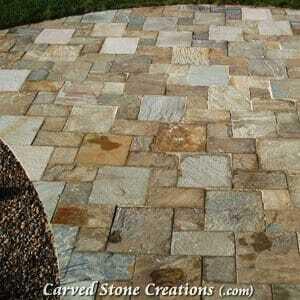 The pattern shown in this quartzite patio features 3 paver sizes placed in a staggered pattern. 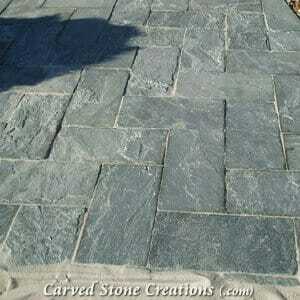 These slate pavers have a classic rustic look to them with their natural cleft surface. A bird bath is an excellent way to draw in a little bit of nature to your yard. We offer a wide variety of bird paths like the rustic bird bath you see below with a rock faced finish and a polished bowl and accent stripe which creates a pleasing visual contrast. 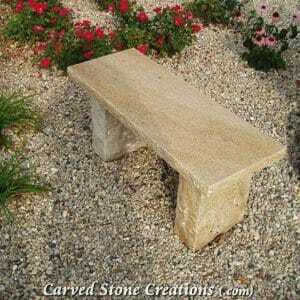 A garden bench is a simple and effective way to create seating for you and your guests even where space is a premium. They can also provide a quiet spot to read a book in your garden instead of on a chair on the patio. 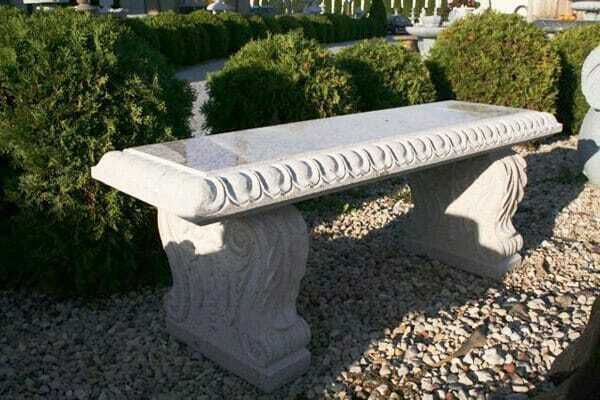 We offer a wide variety of garden benches (most in 48 to 72 lengths) in rustic natural boulder slabs to traditional hand carved classic design motifs like egg and dart moldings. This rustic stone bench has a rock face base and slab with a smooth polished seating surface which offers a wonderful accent. This Giallo Fantasia Dark Granite garden bench features a classic egg & dart design motif on the edge of the bench which is complimented by scroll work and Acanthus leaf carvings on the legs. A polished top adds contrast and durability as well. 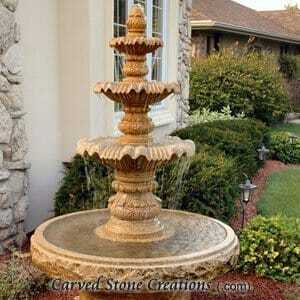 Thinking you would like a fountain but you just cant imagine how you could possibly fit one in your backyard? We can make it happen! Not all fountains require a large amount of space. 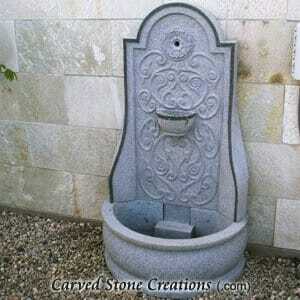 Consider one of our basin fountains. The 3-tiered granite fountain below includes an attractive stone basin which collects and recirculates the water from the fountain and is only 42 in diameter and 54 tall. How do we do it? We install a pondless basin beneath the pebbles so that water drains into a high strength plastic tub beneath the ground and recirculates the water with a pump. Depending on the size of the fountain and the water flow, you can use a pondless basin as small as 36″ – 48 in diameter. 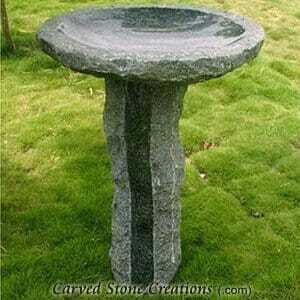 Put down some pebbles to cover it and you have a beautiful fountain for the center piece of your garden. Still dont think you would have the room? Consider installing a wall fountain. Even in a narrow yard you can still find a spot for one by installing it against the wall of your home. This beautiful granite wall fountain is only 32 Wide, 20 Deep, and 54 High. What about planters? Skip the clay pots and add some elegance to your garden with a carved stone planter. 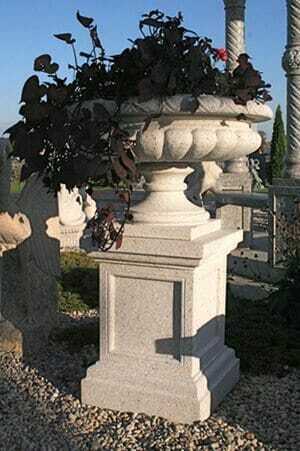 The granite Victorian urn planter you see below has timeless classic styling and at 30 in diameter and 48 high with an 18 square base its just big enough to make a beautiful presentation of flowers without taking up all the space you have to spare. Starting to see how it could all come together? All of the items so see featured in this article are in stock and ready to ship and can be purchased from our Online Store. Dont see what youre looking for? We can custom design and make anything for you if you desire a different stone, size, or style. Please allow 14-16 weeks for production and delivery on custom designs. We also encourage you to visit our huge outdoor showcase at our show room located in Kaukauana, WI. We are a reasonable drive away from many Midwest metro areas including Milwaukee, Madison, Chicago, Indianapolis, Fort Wayne, Minneapolis, St. Paul, Grand Rapids, Ann Arbor, Traverse City, Davenport, Des Moines, St. Louis, Kansas City, Cincinnati, Columbus, etc. Our outdoor showcase features several choices of water fountains, wall fountains, bubbling fountains, spitting fountains, planters, benches, statues, and other landscape décor to chose from. Outside of the Midwest? We also ship and install nationwide. We have done projects from New York to Florida to California too.